Writing is a way of making sense of things. It is a way to collate, consider and consolidate thoughts. Writing is my way of making sense of things I see and experience. There is a lot of repetition and revisiting of ideas in what I write from which the things that hold the most resonance are visited again and again in new ways as I attempt to find out more. 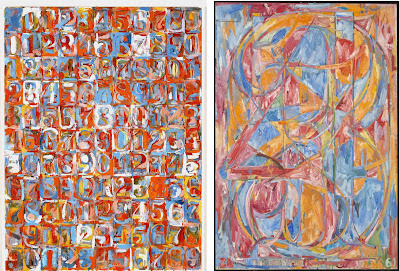 The ‘havoc of sameness and difference’ as quoted from an article about the Jasper Johns exhibition, by Paul Keegan in the Times Literary Supplement is at play in both my own anxiety to offer something new or stick to what I know in the writing of this post, and in context here, to the repetition and use of familiar motifs throughout Jasper Johns’ career. 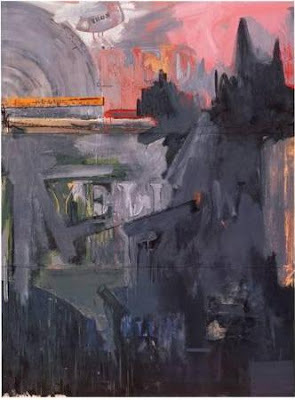 From the 50s to the present day, the American artist now in his eighties has prolifically explored the visual and pictorial language of painting and mixed media through reoccurring imagery such as flags, numbers, letters, words, body parts, targets, shapes and colour. There is a progression of themes in the exhibition, aptly titled ‘Something Resembling Truth', each room explores a different obsession that Johns had in which the works are similar but different, a reference to the repetition within Johns’ own work and the play of the real against the representational, abstract and illusionary. An example of which is pictured here in two examples of Johns’ Target paintings. 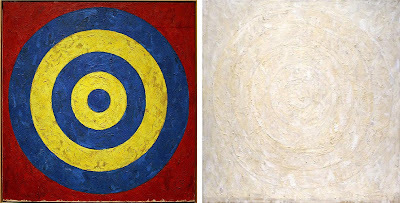 These are paintings as objects and as illusion both at once; the way the paint is applied to the surface is almost 3-dimensional (using wax added to paint), the large scale of some of these paintings only adding to their presence as 'painting as a physical object' in the room and not merely a representation of, in this instance, a target. Similarly, in his flag paintings the work occupies a duality between representation and object, i.e. it is a representation of the American flag but it is also a series of stripes and stars rendered in paint so as to become a new object in itself, “...between seeing and language, between what we see and what we know.” The language of visual art as a way of communicating and the literal nature of written language and symbolism is further layered in the number and alphabet pieces for example in ‘0 through 9’  the numbers, unsurprisingly from 0 to 9 are layered one on top of another so that they become almost unreadable and obscured into the abstract. Johns is quoted as once saying, “a picture ought to be looked at the same way you look at a radiator”. It may come as no surprise to some of you that I have actually spent some time looking at radiators, or heaters at this side of the pond, and never found them to be quite as interesting as many pictures but the implied sentiment from Johns is a good one, in that the act of looking should be inquisitive and exploratory, as though looking at something [a radiator] with consideration for its familiarity but for the first time due to its invisibleness for the fact it is so often overlooked. This should be the same treatment with which one sees a picture or painting (discuss). Conversely, it can also mean that a picture should be regarded with the same banality as that of a radiator which is amusing and neither a bad thing to remind us not to take the act of looking, too seriously. It is a provocative statement to make and reflects Johns’ philosophy to take what the ‘...mind already knows and make us look again’. 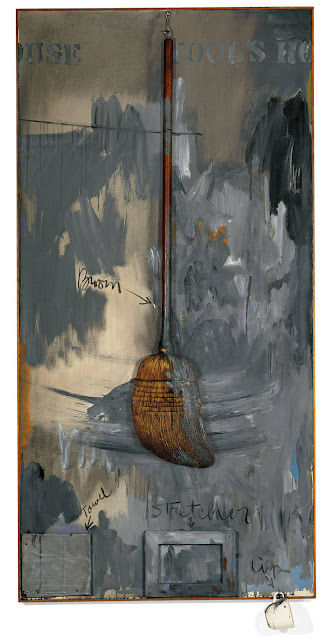 The broom in ‘Fools House’ [1961-62] is both structural protagonist of the painting as well as the means by which the sweep of paint was manipulated across the canvas. The objects in these paintings take on new purpose as formal components of the paintings they reside in; a broom becomes a straight line, a can becomes a cylinder, a neon light becomes a colour to work with that isn’t physically present like paint, a fork becomes a ledge from which a chain can hang from, a ruler is a line of yellow that implies a sense of order and precision that never comes to fruition. I am a huge fan of these works and find their unexpectedness and visual variables a pick and mix-like indulgence or a welcomed disruption to the eyes that jazz music is to the ears. Both make seeing these works now still relevant and exciting! Going back to the bronze paintbrushes in the Savarin coffee tin, I hope I have explained some of the context as to why I think it is a significant work. In being cast in bronze the brushes and tin are less real because they have been made with the purpose of looking in mind and not use, they have been made to be looked at; the point in time in which they came to be inside that tin captured forever. 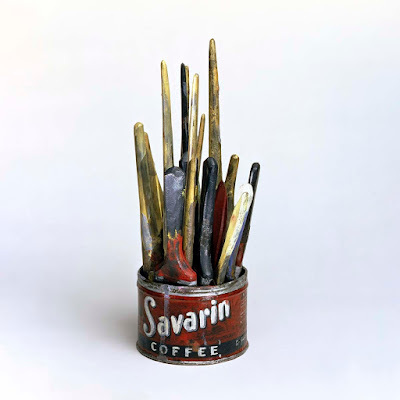 Whilst they are convincingly painted (right up to their stains of use and wear) and realistically proportioned, they don’t sit in the way that real paintbrushes do when residing inside a pot or can, their bronze-cast rigidity makes them almost too static and they lack the differences in texture of metal versus wood that the eye can distinguish. It is like exposing an imposter and my eyes enjoy the visual conundrum and illusionary trickery it plays. It summarises why I enjoy much of Johns’ work, seesaw of real and unreal, truth and deception; the double-take, counterbalancing visual language with that of written language. It makes you think without being convoluted or too pretentious. The bronze in the exhibition sits alongside two drawings; one in ink and one in graphite of the same display; they are all different versions of the same thing but operate in different ways. The drawings place the paint brushes in full centre becoming the artistic equivalent of a vase of flowers whereas the bronze becomes a fake prop and a new surface on which to apply paint. 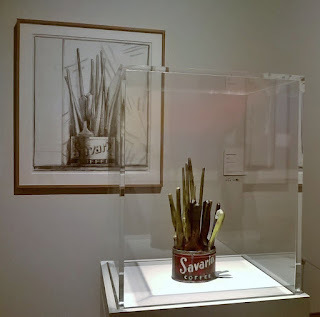 For me personally, these works symbolise the moments of inactivity within art, when the contemplation happens and the tools reside their work carried out until such time when they are used again. There are two specific lasting memories I have of paintbrushes in cans and they are; a photo of brushes in two used dog-food cans in the window of my grandfather’s tool-barn on his farm and of the paintbrushes of a painter who taught me during my degree who had his brushes in a pot placed on his coffin at his funeral. In both instances it struck me how deeply poignant the reverence I place upon objects has with their association to the people who used them. I remember the way the light was hitting the weather-beaten and algae-coloured corrugated Perspex window of my grandfather’s tool-barn against the silhouette of these two paintbrush cans being something celestial, almost like stained-glass within a church such was its importance to me and how I remember my grandfather. 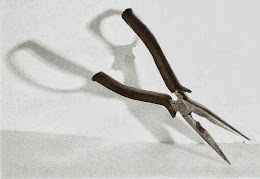 It tied into my research into tools during my degree, but nonetheless is an image, like Johns, I have reproduced and come back to more than once but never fully realised yet. It also brings me back to the discipline of writing and how it offers a way into processing exhibitions that I see. 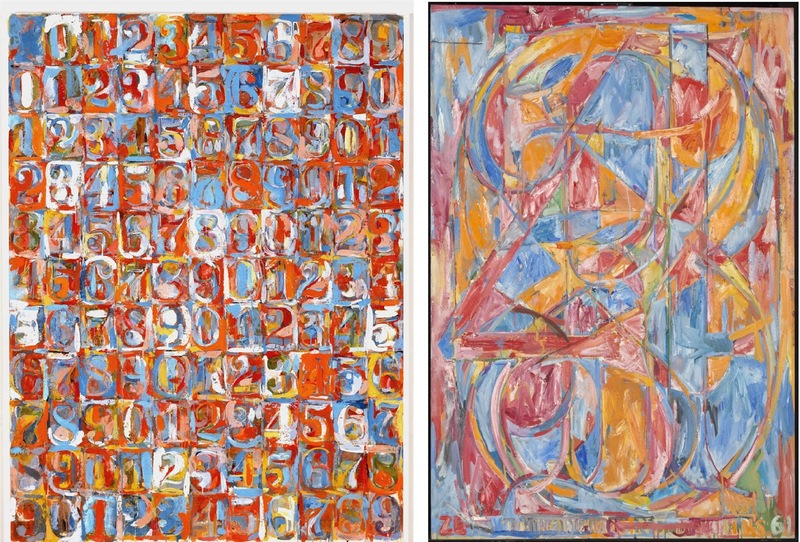 I cannot be sure if I looked at every piece in the Jasper Johns retrospective in the same way that I would look at a radiator but much has made me want to look and look again. Includes quotes from ‘The only one seeing things’ by Paul Keegan published in the Times Literary Suppliment 24th November 2017.